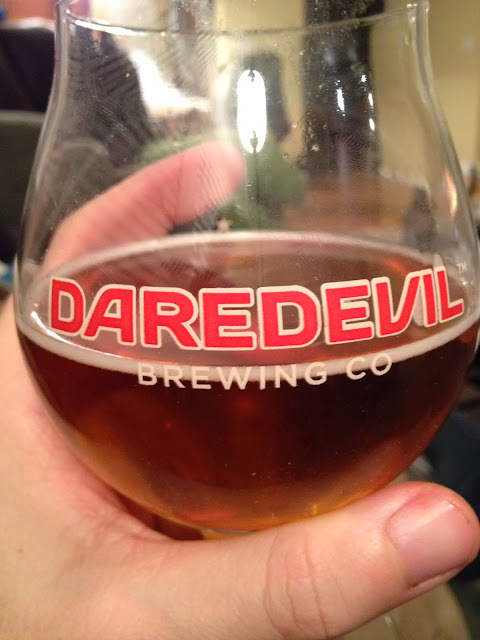 I was first introduced to Daredevil Brewing about 10 months ago while visiting TwentyTap with a friend. I had never heard of them, but with acool name and a penchant for IPAs, I ordered their Lift Off IPA. Off the bat I fell in love and my first thoughts were: "Who are these guys and when will they package this beer??" 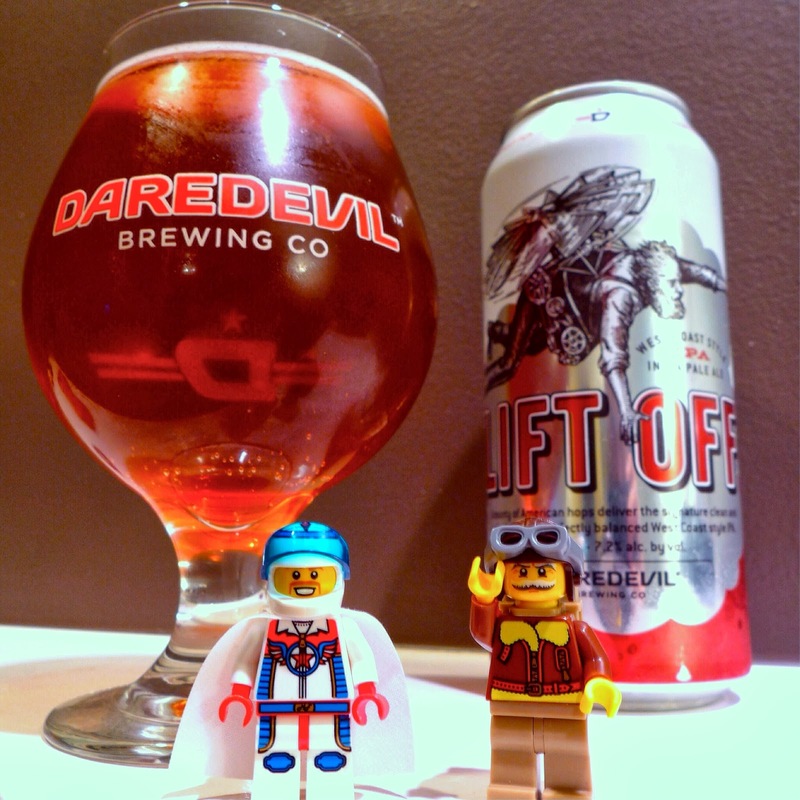 Generally speaking Daredevil likes to have Lift Off always available with a different "seasonal" rotating through. In previous conversations with the guys at Daredevil, I always asked what a lot of people asked: "When are you going to bottle Lift Off?" and they would patiently reply with "We're hoping early 2014", which is why I was pleasantly surprised by their announcement of a November 2013 can release. The guys did a great job with the release on many levels. 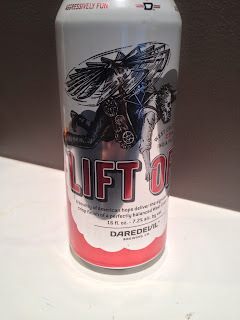 First, they constantly kept people informed via social media about the timing and locations of their newly released cans making it easy to track down Lift Off- assuming the store still had some! Secondly, the packaging is awesome; I love the 4-packs, the 16oz cans, and I've always been a huge fan of their branding, which the can artwork does justice to. Lastly, the #HandsOnOurCans contest is a cool idea and has generated a lot of fun and creative pictures (including some of my own) from Lift Off drinkers. So let's talk about what's in those sleek looking cans! The color is right on with what you'd expect from a "West Coast"-style IPA: bright copper liquid with a finger of off-white head. It smells of the classic American hop aromas of grapefruit, pine, and caramel. The taste gives grapefruit and pine up front, with some breadiness and caramel mixed in before finishing pleasantly bitter. The mouthfeel is middling with decent carbonation, and a crisp finish. It's well balanced and hits the right notes, but I would like to see just a bit more hop flavor and bitterness if it's going to be called a west coast-style IPA. It's also a little bit thicker than a traditional IPA in my opinion, but the 7.2% ABV provides some explanation for that- some increased carbonation might help here. At Indy Beer News' Panel Discussion at Tomlinson Tap Room a very strong point was made that all breweries, but new ones in particular, need to put a strong emphasis on quality. Black Acre is a good example of a brewery that struggled in terms of quality when they initially opened. Justin, Black Acre Head Brewer and Co-Owner, put in a lot of research and hard work to identify and fix the problems they were having with the quality of their beer. This seems to be a bit of a trend for new breweries in the area. However Daredevil, IMHO, has been producing a very high quality product from the very first batch. Batch #1 was a hint too low in hop flavor/bitterness but it was still a very solid brew, and the issues with Batch #1 were fixed with Batch #2. Every one of their seasonals I have found to be great examples of style and great drinking beers. I highly approve of what those guys are doing, and as always cans are superb containers, and the 4-pack is very competivetly priced. Thanks for the comment Jake. As I inferred from my post I'm also a big fan of what Daredevil is doing with the quality of their beers and the new packaging as you echoed yourself. 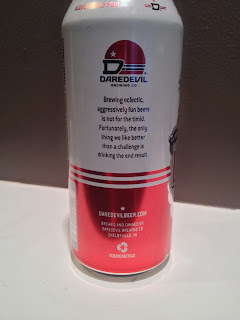 I've been lucky enough to talk with both Michael and Shane on a few occasions (and have even poured beer for Daredevil at a festival) and it's very clear they're passionate about the quality of their beer, so I'm confident that any tweaks that need to be made for the canned product will be made in short order.